The ritual of making a bedtime tea can be enough to calm the mind. Chamomile and lavender sooth the nervous system and tone the parasympathetic nervous system, stimulating our ‘rest-and-digest’ mode – the ideal state before bed. Chamomile also helps to reduce excess cortisol, a stress hormone which can be damaging in large amounts. Chamomile can ease stomach cramps and may also be helpful in preventing migraines. 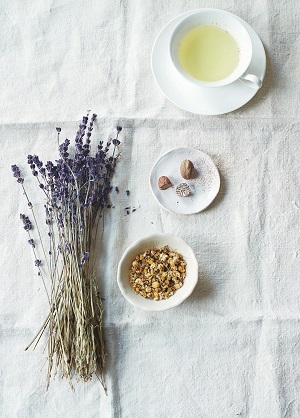 Combine the chamomile, lavender and nutmeg in a teapot and pour over the freshly boiled water. Steep 5 minutes then strain into a mug. Use with caution or avoid altogether if you are pregnant or attempting to conceive.